Some would think that grilling season is almost over. For us, however, it’s far from over. It neverreally ends at my house. A couple of winters ago Kansas City found itself in the midst of some crazy snowstorms and several feet of snow on the ground, and this happened several times. Said snow did not stop my husband from grilling. We just love to grill…well, Paul loves to grill. He’s truly talented when it comes to grilling. He (unlike me) takes his time and is so thoughtful when he picks out flavors to use and how hot he wants the coals. Yes, coals, he will only grill on our charcoal Weber grill. And when we decided to stay in on a recent Friday night, we picked a menu of grilled chicken and veggies. And Paul picked this Star Fine Foods olive oil out of the cabinet. I took this as the hint that it was and I’m so glad that I did. These infused oils are top-notch. The infused oil was perfect for these veggies and even better with the pasta salad….which I made the following day with the leftover grilled veggies. And Star Fine Foods is offering a fun giveaway, including balsamic vinegar and olive oil, to one of you, see below to enter! I usually make way too many grilled veggies. First because I’m always afraid that there won’t be enough. I end up cutting up a few extra of each because inevitably I’ll end up snacking on a couple of tomatoes and peppers before they even make it to the grill. But second, because I adore leftover veggies. 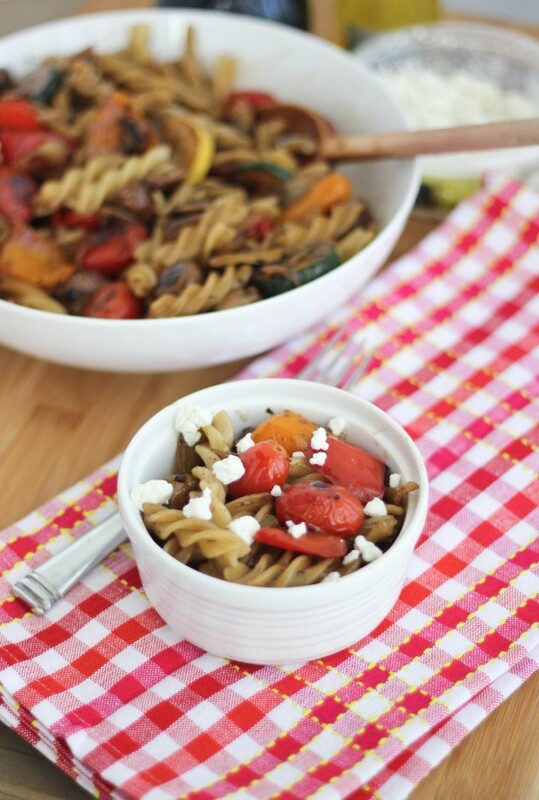 I’d had this balsamic pasta salad on my mind for days and I couldn’t imagine any better addition that the leftover grilled veggies! A quick & simple recipe for using leftover grilled veggies. Fresh pasta is combined with leftover grilled vegetables and added to a simple balsamic vinaigrette for a side dish or main dish. Meanwhile, mix the balsamic vinegar, olive oil, thyme, salt and pepper in a large bowl. Drain the pasta and add to the bowl with the balsamic vinaigrette. Stir well to coat the pasta. Add the leftover grilled vegetables on top and sprinkle with goat cheese. This pasta salad can be served hot or cold. Leave out the cheese for a vegan adaptation. When grilling the vegetables, we used Star Fine Foods garlic-infused olive oil, dried thyme, dried sage, salt and pepper and grilled them in a grilling basket for 15-20 minutes, tossing the veggies often. They get a nice char and grilled flavor and cook very evenly. Store the grilled vegetable leftovers in the refrigerator in an airtight container until making this pasta salad. Alternately, you can roast the vegetables in a large baking dish at 400 degrees for 25-30 minutes until tender, tossing often. 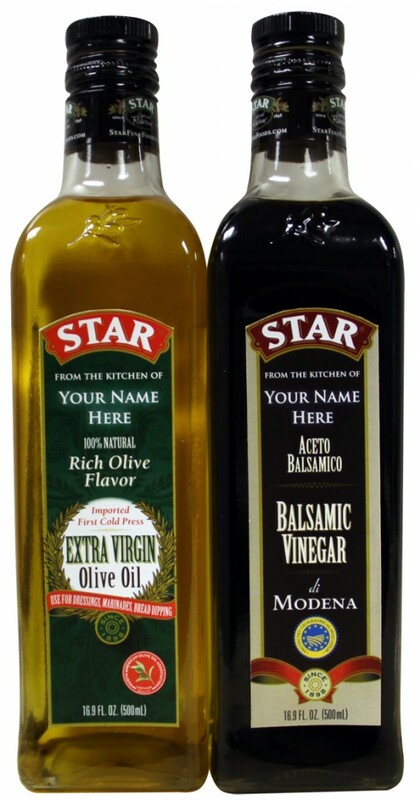 Enter to win this personalized set of Star olive oil and balsamic vinaigrette. Three Bake Your Day readers will win this set, in a caddy, with the bottles personalized! To enter for your chance to win, click here! Disclaimer: This giveaway is being sponsored by Star Fine Foods. I received Star Fine Foods products described to review. I was not compensated in any other way and as always, all opinions are my own. This giveaway will be open until Sunday, September 9. Contest is open to US residents only. For my full site disclosure, click here. This post contains affiliate links. Truthfully I’m not a big veggie person BUT I’d love to make this for my veggie brother or just a party sometime. Looks great! I love grilled vegetables–this looks so good! That pasta looks incredible! Balsamic has to be one of my favorite condiments. This looks awesome!! 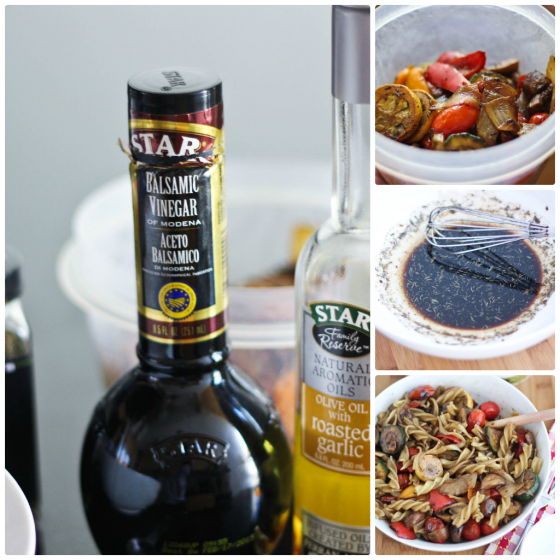 I love balsamic vinegar…and the addition of grilled veggies, I love it! I could take a bath in anything with balsamic…love it! this pasta looks amazing! I love left over grilled veggies, I always make at least double what I need and they make the fridge smell so tasty! Open mouth insert 55 trillion buckets. 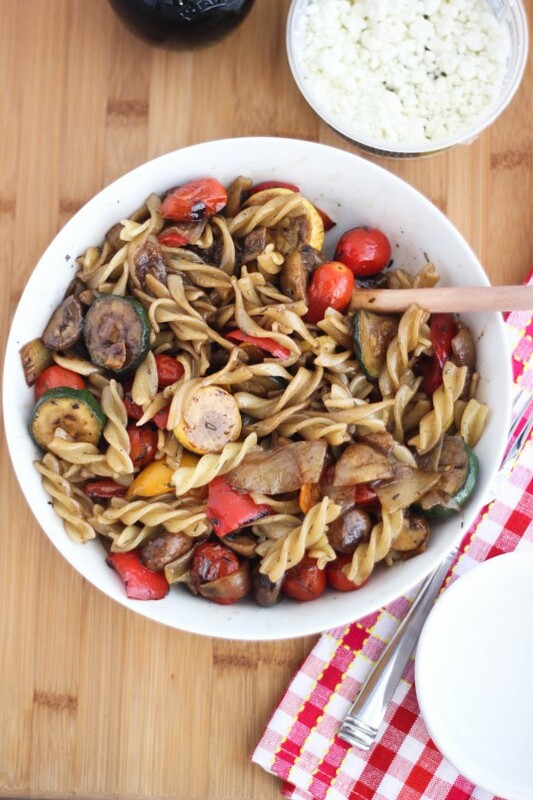 i absolutely love balsamic AND i love pasta salad, so this is right up my alley. YUM! Roasted veggies – double check. I love your pasta recipes, Cassie!! This looks gorgeous, and I probably have everything I need already at home… perrfect!!! Wow. Thyme? Goat chese? Pasta?? Grilled veggies??? This dish is a veritable buffet of my favorite tastes. Fantastic recipe, Cassie! My husband will LOVE this. he is a huge fan of balsamic vinegar. This looks so good! Oh my goodness – I feel like diving into that bowl of pasta goodness. Love it! It was great meeting you at IFBC – hope to see you again soon. Cassie, this looks and sounds ah-mazing! YUM! Mouth.Is.Watering! Wow that bowl of pasta looks like it needs to be eaten… By me! It looks super delish!!! I’m the griller in the family. My Husband used to be, but he overcooks the meat. In California we grill till about October then stop. But when I lived in Buffalo we grilled all year round. I wonder why we did that? Your salad looks delish!! i could eat pasta and veggies with olive oil and balsamic vinegar for the rest of my life. i love the flavors it gives off! I could eat this everyday! I love how you added crumbled goat cheese in this. Everything about this pasta makes me happy!!! This looks so delicious! Yay for never ending grilling season! Yay for veggies and pasta salad! Yum! Some of my favorite things appear in this recipe – grilled veggies and balsamic vinaigrette! Love this recipe and can’t wait to give it a try! 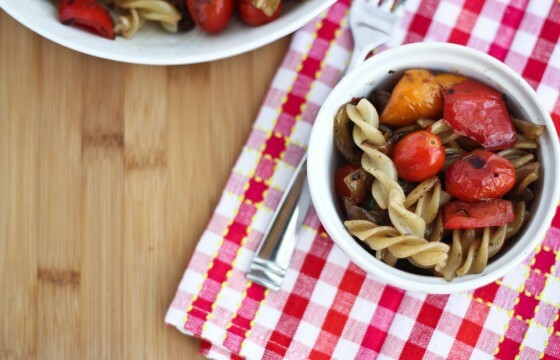 I love balsamic & pasta salad! This look awesome, especially with the goat cheese! You made this for me right? Thanks!! 😉 looks delicious Cassie, my kind of food!